The concept of support and resistance is a very powerful one, and it works because of reasons I’ll explain later, which surprisingly few traders take the time to think about. Often, when you study a chart, you can see a price level which the share price does not go below. In fact, the share price – or whatever other financial instrument you are looking at – repeatedly goes down to that level and bounces back. That level is called the support level. In a similar way, the resistance level is a price point that the price will go up to, but never seems to go past, instead just coming back down again. When a price is going sideways, you will see it fluctuate between the support and resistance levels, which it can hit many times. The more times those levels are tested, the more confident you can be that the price will not penetrate them. So as the price approaches one of the levels, you can expect and look for a “reversal”, and as soon as you see it start, bet in that direction, as explained later in the final strategy. The support is about 26.6 pence, and the resistance approximately 29.5 pence. 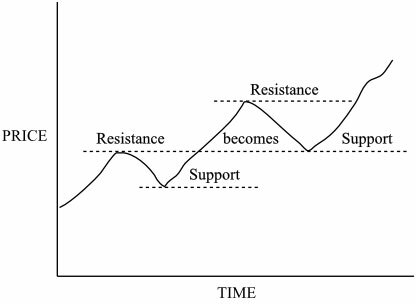 Another idea about support and resistance is that, when the level is finally broken it becomes the opposite. For instance, you can see in June and July the price was pushing up, testing resistance at the 26.6 pence level, and getting knocked back down again. But when it broke through in August, that resistance level became a support which was visited in September, November, and December and held strong. One of the reasons it is worth looking at different time scales of chart is that you may be able to find levels of support or resistance by looking further back, and these may help you decide what the price will do in the future. Frequently, levels from perhaps years ago will be revisited and still hold strong. The horizontal lines are at whole numbers of thousands. See how the price tends to treat each pair of lines as a range that it fluctuates within. 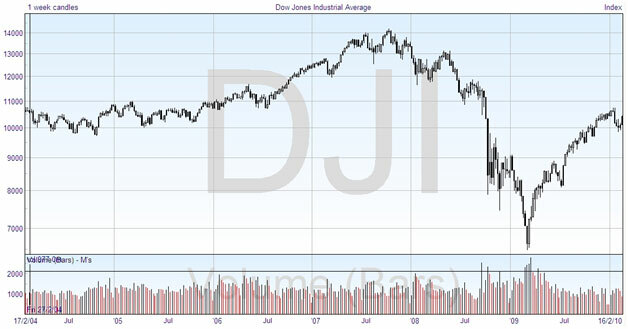 In 2005, the index bounced between 10,000 and 11,000. After breaking away, in 2007 it was oscillating between 13,000 and 14,000. You can see other places where this occurs on the chart. Now it’s time to discuss one explanation why support and resistance work. They are of course psychological barriers, and not physical barriers, and they show how the psychology of the market dominates price movements. Consider the thinking patterns of three different trader groups, one which has bought the stock, or gone long, and is hoping for an increase in price; one which has bet in the other direction and gone short on the stock; and a third group standing on the side-lines, which hasn’t taken action yet as they are not sure which way to trade. The first would be congratulating themselves that they had bought the stock and it was going up. They wish they had bought more, and might do if the price comes back down to the support level. The second group are thinking that they weren’t very wise to go short. They will hold on for the moment, hoping the price will drop back down so they can close the position, called “buying to cover”, without losing too much money. The third group are seeing the price rise, and thinking that it’s too late to buy now. Perhaps if the price comes back down to where it was they should buy some shares. As you can see, although they all have a different way of looking at the situation, each of the groups wants to buy some shares if the price comes back down to the support level. 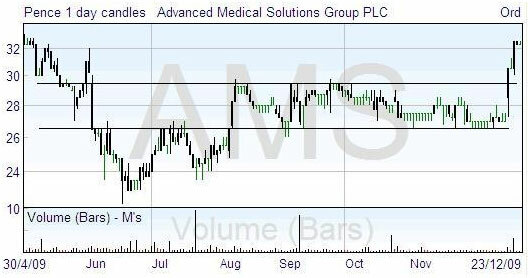 The demand for shares will force the falling price to go back up, proving the support level. The first group will be desperately holding on to their stock, hoping that the value will recover so that they can sell and minimize their losses. It is the second group’s turn to congratulate themselves, as their short position is now making money. They wish they had shorted more stock, and if the price comes back up perhaps they will short (sell) more. The third group have still not acted, and now think they have missed out on the opportunity to short the shares. They resolve to do that, if the price comes back up to where it was. Everything is now turned around. All three groups are looking to sell the shares if the price comes back up to the support level. An excess of supply will push the price back down, which means the old support level has now become a resistance level. It’s simple human psychology, not magic, that makes support and resistance work like they do. The classic support and resistance levels are at particular prices, that is they are horizontal lines. But it is also possible to analyse charts and draw angled lines which followed the trend of the price, and these can act as support or resistance for the price movement. Not surprisingly, these are called trendlines. An uptrend line is a straight line sloping upwards, which is drawn to touch successive low points in an uptrend. The more low points you can connect with a straight line, the more sure you can be that you have a boundary line. You can start drawing the line with just two low points, but you really need at least a third low point touching it to confirm it is valid. You can see there are several low points that come down to touch the line, and then go back up again, showing it is acting as a support. This chart also illustrates how a support can become a resistance, over on the right-hand side where the price, having dropped below the support line, does not go back up through it. The significance of the trendline increases if it has been shown to be strong, by being repeatedly touched and rebounded from, and by being in existence for a long time. If it is well-established, there is much more meaning if the line is eventually broken. It would usually make you seriously consider closing any long positions you are holding. 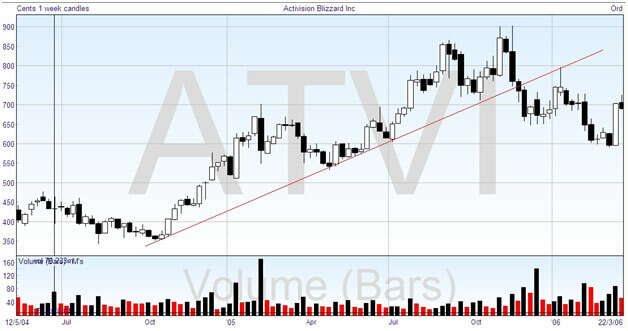 Even with a trending chart, you will not always be able to draw a valid trendline, as the prices may fluctuate too much. But if you can, one basic use is to take the touching of the line as the signal to buy into the uptrend, as the price should only go up from there and not retrace. You can also trade on downtrends, and constructing a trendline for one of these is a similar process. The line will connect successively lower high points on the chart, and if the price touches an established downtrend line, this can be a good time to take out a short position. As an extension of the idea of the trendline, it is also possible to draw a “channel line”, which is a line parallel to the trendline on the other side of the price action. The price will tend to oscillate between the two lines, even as it carries on rising or falling in the trend. Again, not all price charts will allow you to draw this, and you’re most like to see it when there is a well-established and steady trend to the price. It can provide an early warning of a change of trend, as if the price fails to reach the channel line before reversing, this is a sign of weakness. There are some other lines and constructions that you can draw on price charts to set likely reversal levels, but these are the main ones that you need to know about.